My father, Robert John Kelly conducted an interview with his father, Orrin Michael Kelly in 1966. Both of Orrin&apos;s parents (Michael and Sophia Smith) had lived in Jo Daviess County which my grandfather talks a little about. Most of the interview consists of family history and years on the farm near Remsen Iowa. I sent a copy of this interview to Plymouth County on the IAGenWeb site. I was wondering if you would like a copy for Jo Daviess County. Attached please find the entire interview along with the message I sent to the Plymouth County Coordinator. You also may use as little or as much of this interview as you would like for the Jo Daviess website. R: Today is the 8th of May, 1966. We&apos;re at the Kelly house, right now. At 700 North, no, 700 First Street, S.E. (LeMars, IA) and we&apos;re gonna talk to O.M. Kelly right now and see what happened way back in the old days, like the 1860&apos;s. Ok now, I&apos;ll ask the questions and then we&apos;ll get the answers from the Gramps. Now, first off my Grandfather was Edward, and what was his name? R: Edward Ned and then, ah, your Grandfather&apos;s name was Mike. R: And do you remember when Grandpa Kelly, your Dad, was born? And where? O: I do not know. He was born in Galena, Illinois, but I don&apos;t know what date. There was an old Irish trait, they didn&apos;t want to tell their youngsters how old they were. R: Would it be recorded in the courthouse or did that burn? O: That burned down. The courthouse in Galena burnt down. R: Well then your father was born in Galena and that was what about 70 what? O: Oh, he was the oldest of 9 boys, 9 brothers. R: And how old was he then? He died what, in 1932 was it or 33. O: He was suppose to be 85 years old when he died. He thought he was 85 years old. R: Well then you told me one time that your grandfather&apos;s name was Michael? Michael what now again. R: And then you told me that he was a farmer. Where was he farming when he went to the Civil War? O: They were ... my Grandpa Kelly owned a little farm down at New Diggins near Galena, Illinois. New Diggins, Illinois. That was close to Galena, Illinois. O: And since my Daddy was the oldest of the boys he had very little education. He thought he had gone through about the 3rd grade in school. And he helped his Dad with the farming and they had , he wasn&apos;t sure whether they had two horses and two cows or one horse and two oxen. R: Oh, so they plowed then with the oxen? O: Plowed then with one horse and one oxen or else sometimes two oxen. He wasn&apos;t sure whether he had two horses or not, but he knew he had one or two oxen. R: Ok let&apos;s see, your Dad was born then at New Diggins? R: Is that still a town there or not? O: Well, it was a mining town. Yes, I think it&apos;s still on the map. R: Well then you were born at Hazel Green? O: No, my sister Mae and Anne was born at Hazel Green. I was born at Remsen after they came out here. R: Well then Michael ... what was his name again? R: Michael John, was ... did he come from Ireland then too? O: Yes, he came from Ireland and my Grandmother came from Ireland too. R: Oh, and what was your Grandmother&apos;s name? O: I don&apos;t remember. She visited here with us a couple different times, but I don&apos;t remember what her name was. R: Was that County Cork that they came from? O: They came from County Cork, yes. R: Let&apos;s see, how about ... ah ...my Grandma Kelly was Sophia Smith and Redge Smith was the son of a ... Redge is your cousin? O: Redge is my cousin. He was the youngest of 6 boys. Smith boys. R: Then, who was my Grandma Kelly&apos;s twin brother. What was his name? R: Were they both born at Galena? O: Yes, yes they were. And my Grandpa Kelly, that is, yeh, Grandpa Smith, his name was Michael Smith. R: Michael Smith. Then he was my Grandma&apos;s father. R: Was he born in Ireland? O: At Cork, County Cork. R: You told me one other time too that my Grandpa ... his name was Edward Ned? That&apos;s kind of an odd name. O: Michael ... Edward Ned, yes. R: Edward Ned was your Dad&apos;s name? O: Yes. That&apos;s my Dad&apos;s name. Yes. R: Well then you were telling me about one time when some neighbor came and said that Abe Lincoln needed some help in the South. You said that your Father was out there in the field. Was there any other kids at home then still? Younger brothers? O: Yes, there were younger brothers. My Dad said he thought he was about 10 years old at that time, 10 or 11 years old and they were out plowin along the rail fence getting ready to put in a crop and he was ... my Dad was driving the horse and the oxen and ... Grandpa Kelly was ... Daddy Kelly was ... Grandpa Kelly was holding the plow and a neighbor came up from across the rail fence, an older man, and they stopped to visit and this ... they got talkin about the war and how bad the war was going for the north and Grandpa Kelly, that is my father&apos;s father, asked him why the war was going so bad and this man said well it&apos;s because Abe&apos;s needin more men and my Grandpa Kelly then asked this man, "where does Abe need more men?" And he said, "Well, Abe&apos;s needin men down at Nashville, Tennessee". My Grandpa, so my Dad said, handed the lines over to him and started crawling over the rail fence and he said to my Daddy, he said "You go on home and tell Mother that I&apos;m off to Nashville, Tennessee because Abe&apos;s needin more men." And he said he stood there, my Dad said he stood there and watched him walk on down the valley and out of sight because he was going down to some railroad station that he knew about that he could catch a train and he said he didn&apos;t come back for two years when the war was over. R: Well then some of the boys that were at home were older than the rest of the family that were born after he came back from the war, I suppose?. O: Yes, that&apos;s right, yes. He thought that Jimmy, he was next to him, and John were just youngsters then, maybe 4 , 5 or 6 years old. Then the rest of the family were born after my Grandpa Kelly came back from the Civil War. He came back after two years, two years after that why, he returned and they&apos;d only heard from him once or twice during the whole time that he was gone. R: They were still living at, ah? O: They were still living on this little place down at New Diggins. R: That was the name of the town? New Diggins? It must have been a new mining area? O: It&apos;s kind of a mining area, a new mining area. I think it&apos;s still on the map, I&apos;m not sure, cuz those mining names have been changed over the years, ya know. R: Well, then, I think you said something quite a while ago that the courthouse burnt down in Galena? R: A long time ago? O: Yes, a long time ago, before my folks left Galena. They came here in 18 ... they came to Remsen in 1886. R: Did they homestead that place? O: Oh no, oh no. O: That was farmed a long time ago. Arnie had the section and a half of land out here. We were on a ...no a section. We had a half section on our first farm and he had two quarter section farms. R: Oh, you lived on where Mike lived first? O: No, just a half section. That west road where Levin&apos;s farm was, ya know. R: Well then you bought an 80 off the Harney estate? O: Yes, I bought the 80 off the Harney&apos;s.
R: Oh, that&apos;s where that 80 came from? R: Well then he had one quarter, then who did you buy the 40 from then? The 40 acres across the road? O: Well that was a ... Daddy bought that farm from Mr. Flynn. Mr. Flynn was a brother of Mrs. Harney. Mrs. Harney that owned these 3 farms, why this Mr. Flynn was her brother and he owned this 120 and my Daddy bought that from him. O: Well that 80 was right north of the 80 that we owned belonged ... was homesteaded by the Mrs. Olson. R: That&apos;s the Cardell place. O: And that is Charles Cardell married one of the Olson girls, the daughter of the man and lady that homesteaded that 80 and of course they had passed away and this Charles Cardell and his wife inherited that 80 and Daddy bought that from them. R: Where did Grandpa Kelly live while he was waiting to buy that farm ... before he bought that farm? Did he live down there where we lived on the ....? O: Well no he bought that farm while we were still up in the other old place. He bought that farm before we were married, before your Mother and I were married. O: When we bought that place that was the house. That farm was homesteaded too by this Roween Olson, a brother of the man that homesteaded the 80 in the north of us and they ... and when Daddy bought that place we farmed it ourselves we farmed the half section of land there and the 120 too along with it for a couple of years and then Daddy thought that it was too much work and he rented that, our 120, then to a Danish family. O: Always belonged to the old farm. R: The old farm. Well, that&apos;s how come the windmill was down there. R: Well, the way they&apos;re digging wells now though they could dig a well anywhere and just keep goin&apos; down until they get water. It wouldn&apos;t be a problem with water, would it, like we had? O: Well, there is a little problem with water out there. We dug a couple of wells on the east side of the road there and we didn&apos;t strike any water. O: It wasn&apos;t any good. We went down quite deep, 50 or 60 feet. As far as a dug well, that was considered to be quite a deep well for a dug well and then we finally went over across the road and struck water there at about 30 feet. R: Yeh, and then we had to dig it out again in 1930, what 4 or 5?. We had to dig it out again, do you remember? We ran low on water. O: Yeh, we had to dig it deeper. R: Down another 20 or 30 feet. R: And then they took out all that blue clay, you remember, that was piled up there and finally it flattened out. O: And the water was never as good. R: No, I don&apos;t think so. R: How come it&apos;s so hard to get water down there when there were springs up in the 80 that was up another 100 feet higher. O: That was one of the strange things, you know. There is a spring up there in the south 80 that we owned. Do you remember that trough that we had in there? There was a spring run through that so the cattle could go along, we had cattle up there in that 80, and they could go along and drink all summer long out of that rough. The water would run in one end and out the other. R: And it kept running for years even I think in &apos;37 when it got dry. O: About &apos;36 or &apos;35 it dried up. R: Well we should have cleaned the dirt out of that every spring though. O: Well that was a dry year. R: The dirt would come down and maybe it went back and plugged it up a little bit. O: During a heaving flooding water, the water would run down through that valley in there and run into the same run and flush in quite a bit of dirt in that trough you know. Maybe that had something to do with the stopping the flow of water, but then see our windmill was almost a quarter mile farther down the road than that. R: Well getting back to my Grandma Kelly, Tom Smith was her brother? Did you say Tom Smith, the one that always had the funny sayings? O: No, he was my mother&apos;s brother&apos;s boy. R: Oh, he was your cousin, then? O: He was my cousin. Yes. Yes. R: And then Redge Smith was another son. O: Will Smith is the oldest, then Tom and Homer and Redge and Bill. R: Well then your mother&apos;s father was named what, again? R: He was born in Ireland? O: He was born in Ireland. My mother was born in Ireland but she didn&apos;t come from County Cork. I just don&apos;t remember where she came from ... another part of Ireland. O: Oh no, no, she was born ... they were ... no, I thought you meant my grandmother. No they were born right in Galena, right at Galena, in Jo Davies county. I don&apos;t know just where they lived. 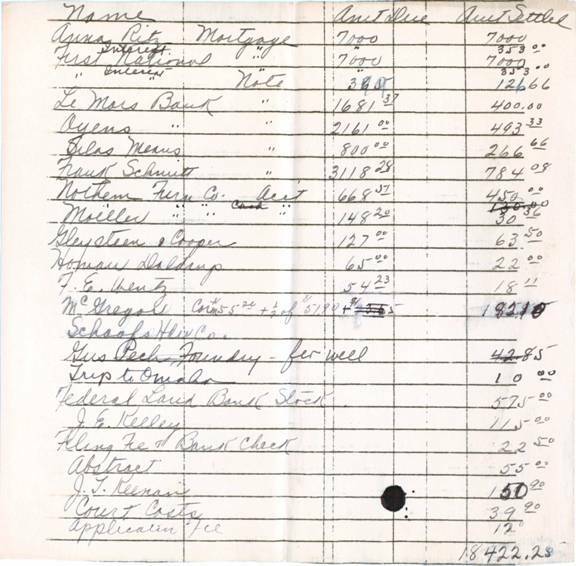 My Grandfather, Grandpa Smith owned a farm and was considered to be quite wealthy at that time. R: Oh, well then you don&apos;t know where in Ireland that your Grandfather or Grandmother ... you don&apos;t know your Grandmother&apos;s name? O: No, I don&apos;t remember my Grandmother&apos;s name, don&apos;t remember her name. Ah, my Grandfather, I don&apos;t know whether I told you or not, my grandfather died ... was killed ... drowned. He was in Galena driving a team home late at night or late in the evening in the dark and crossing the bridge at the Galena River there a mile or so out of Galena. They call it the Galena River and it&apos;s a pretty good-sized river. It was a big river because in the early days they ... boats used to come up from New Orleans right into Galena, right into that river there. Up the Mississippi and then out of the Mississippi, the Galena river went into the Mississippi down there. a little bit south of Dubuque and these boats used to come up from the Gulf of Mexico and they picked up this iron ore and steam right into Galena, Illinois, and of course this ore was hauled down from the mines and loaded onto these boats and he, Grandpa Smith, always had good horses, somebody said, and coming home from Galena, why he missed the road in the dark and the horses plunged into this river and he was drowned and they didn&apos;t find his body for a few days after that. Both horses were drowned. R: Oh, so you didn&apos;t know your Grandfather then too well. O: I didn&apos;t know Grandpa Smith at all. I didn&apos;t know my Grandma Smith either because she died. She died before my mother was married, sometime before my mother... She died with cancer. One of the very first cases of cancer that they knew of at that time. She had cancer of the breast. My mother said that she went with her down to Aurora, Illinois to some sort of a hospital they had there and they removed her breast with the cancer. And she was down there a couple of months and seemed to be cured about a year she passed away with cancer spread all through her body. That was the ... of course, mother, my mother, you know, had developed a cancer on her breast and she wouldn&apos;t tell anyone about it or anything about it until it had gotten to an advanced stage and as soon as Daddy heard about it why he insisted that she go to Rochester, which she did. She went to Rochester and she was up there most of all...she must have been up there for 4 or 5 months at Rochester. Daddy spent around $8,000 on that deal up there, because everyone of the family went up, your mother went up and I went up and of course we were married at that time. You don&apos;t remember that? R: No, yeh. I kind of remember when she was at Rochester, yeh. O: And Anne went up and Mae went up and when everyone went up to see her, why Daddy paid all the expenses. Of course, he was up a couple of times. And she came back and they told her that she would probably live 10 years. R: This was in about the late 20&apos;s, wasn&apos;t it? O: Yes, the late 20&apos;s. I think it was 28 or 27. O: Yes, and then she didn&apos;t die with cancer. The cancer had developed on the other breast and it was bad but she was past 80, I think 83 or 84. R: I think she was 84, as I remember. O: But the doctor said that she just couldn&apos;t stand an operation, surgery on the breast, and it got awfully bad. But that didn&apos;t kill her because she was suffering from it so we got Kinny out you know to take care of her and they called in here, and I don&apos;t know, Kinny called me. We lived here in LeMars at that time and I was working for the Co-op. R: You were living down the street here. O: We were living down the street and they wanted a bed. I took a bed out there, a cot. I don&apos;t know whether we had a cot or I borrowed it so that Kinny could sleep in the same room with Grandma, you know. So we took cot out. I took the company pickup that I was driving and took the cot out and we drove up that porch, that enclosed porch. You know how that rail was around it up there, you know and we handed the bed up over the rail and Kinny was up there taking ... and someone else was up there and I was upstairs and so as I was going up the stairs, Kinny hollered at me and she said, "somethin&apos;s happened to grandma", and I went up and you know, Kinny had gotten her back ... she was sitting on the edge of the bed and Kinny got her back into bed and just a few minutes after that she passed away and we got the Doctor and he said it was a heart attack. R: Well, I had just got back from furlough. It was in September 1941. O: It just seems to me somebody did help. O: Galena was a city, almost before Chicago was. It was because of the mining, zinc and blackjack mining at that time. R: What was blackjack? What was that? R: Well they&apos;re all black now. Aren&apos;t they all black piles? R: There was a big Irish settlement there though, wasn&apos;t there? R: Well, I&apos;m going to try to write this down after I go through it again so I don&apos;t know if I&apos;ve covered everything, but none of our relations ever came from any place other than Cork, County Cork, did they? O: Not that we know of, no. Not that we know of. R: Then if there&apos;d be any records back in County Cork, then this&apos;d be the place to go to find them to see maybe we can find some of the Kelly&apos;s or the Smiths. Is there any other name that is in the family. O: No, and this is S M I T H and S M I T H is an odd name for an Irish family. Now that&apos;s what they tell us. O: Yes. Smith is not an Irish name over there. S M I T H. Now I don&apos;t know why it would be. They said that Smith is an English name. R: Well, that&apos;d be terrible wouldn&apos;t it? O: Yes, but the ancestors of the Smiths all came from ... as far as I can remember, but I used to hear Grandma Smith tell that ... and you know, another thing Bob, this is interesting and that is that Mother, Grandma Smith, er ... and Grandma Kelly and Joe Smith were twins and they were both entertainers. Now I don&apos;t know how ... I don&apos;t know how old they were before they finally quit but they used to go out entertaining. Both danced and they both sang and I don&apos;t know if you ever remember or not but Daddy was so ... so ... ah ... I don&apos;t know whether he was jealous of Mother. I guess he was. And he wouldn&apos;t allow her to go through any of her past life as far as entertaining was concerned, you know. But my Mother used to dance and they were called a song and dance pair. O: About those youngsters as a song and dance team and they did a lot of entertaining at local functions and I don&apos;t know whether they had gone very far from home or not but they were considered to be almost professionals. They sang and danced, buck and wing, and soft-shoe, soft-shoe dancing, and buck and wing dancing. R: Well I remember Grandma Kelly doing the Irish jig, she called it and then you did it too, remember? R: Did you learn that from Grandma Kelly? O: Yeh, yeh. But I never was as light on my feet as Grandma Kelly was though. But Uncle Joe Kelly told me a lot more about the song and dance team than my mother ever told me. He talked about being down at Peoria, Illinois one time to some kind of a stockwood gathering and he said they were brought back several times because of their song and dance number and their soft-shoe and buck and wing dancing. R: Well then Grandpa Kelly was a fiddler. Did he play at dances or anything or just fiddled around at home? O: He just fiddled around at home. He liked music and I think that before he was married I think that he used to play at dances a little bit. I&apos;m not too sure about that, but he played all the old tunes like Turkey in the Straw and all those of that age. R: Well, didn&apos;t Redge Smith have a little musical group? O: Yes, Redge Smith was ... he had an orchestra for years, yes. He played a violin. He had some training and he used to read music some but he played a lot by tune. But he had an orchestra, played for dances all over the area down there. R: Well then was there anybody else in the family that had talent in that way or do you remember? O: Not that I know of. No. Not that I know of. O: Tom, Tom, Tom Smith, he should have been a comedian, you know, because he had the doggonest answers for questions and they were always on the top of his tongue and he would, ah...could answer you on almost any subject you&apos;d bring up, he&apos;d answer you in some sort of a comedy answer. I remember I could go on for a half hour if I could think about it. I remember that he used to like to dress, he was always well dressed, nice shirt, Stetson hats, handmade shoes, and the finest kind of clothes he could buy. People would say, "My goodness, Tom, you look nice. You&apos;re so dressed up." He&apos;d say, "No use being poor and lookin poor." And many sayings like, just always at the tip of his tongue. And he was poor. Just a farmer there. R: Well then was he ...he seemed to come out here and visit quite a bit? O: Yes, and another strange thing about that he used to ... about once a year ... he worked for my father on the farm for 3 years. He&apos;d come out in the spring and work until after corn pickin&apos; and about twice during that time he&apos;d go on a drunk and he would tell Daddy, "Now," he said, "I&apos;m goin on a ... I&apos;ll be gone a few days." He says, "It&apos;s not too busy. I&apos;m goin take a little vacation." He said , "You know, drinkin is a business of its own. You can&apos;t drink and do anything else." When he come back from those drunks that he was on he would be so depressed and I remembered him saying a number of different times, he said, "Don&apos;t be surprised, Orrin, if you find me dangling from the rafters." R: So it was kind of like a hangover then? O: And then I would just laugh it off and he&apos;d say, "Don&apos;t be surprised, Orrin, if you find me dangling from the rafters some day." But he did, he committed suicide. He shot himself back at Galena, Illinois, after one of those drunks. So he had that on his mind years before that, before he really ... before he finally did commit suicide. R: How old was he when he committed suicide? O: Oh, he was around 50. R: 50? Well that isn&apos;t very old. R: He seemed to be one of your favorite cousins? R: You seem to ... maybe you knew him a little better than some of the other ones? O: I knew him because he was such a swell fella and I always liked his line of talk. He always had a line of talk and the fact that he was ... could see the bright side of life ... only after one of his drunks he was on. R: Well, this must have been somethin&apos; in the back of his mind, then when he&apos;s get drunk it would bring it out. O: We often thought about that. I told Redge when we went back to his funeral, I said, "You know, 15 years ago I heard Tom say after getting ... and that was ... he and his brother, Homer, were farming and Homer drank some too and they got into some kind of a squabble and they both got drunk and Homer left and was gone a couple of days. And Tom thought he wasn&apos;t coming back, I s&apos;pose, and when Homer finally went back he found Tom dead in the house." R: Well, was the family, the Kelly family and the Smiths, were they kind of drinkers or something, most of them? O: No, my Grandpa Smith was. Grandpa Smith, that&apos;s one of things that happened to him. R: Well maybe he fell in the river when he was coming home from a party or something. Is that how he fell in the river? O: No, he drove a team into the river. R: Oh, he drove a team into the river. O: At one time he was quite wealthy. He owned quite a big of land. He owned some mining stock there. R: Well, my Grandpa Kelly, I don&apos;t think he ever drank, did he? O: Not that I know of ... no, my Dad? O: He never drank, never took a drink. R: Sure did smoke and chew, though, didn&apos;t he? O: He chewed quite a little. Smoked some. R: What&apos;d he smoked a pipe and then chewed that Country Gentlemen, then out of that tin pail. O: He used to chew Star and Horseshoe. That came in plugs, don&apos;t you remember that? R: Yeh, that came in plugs, but he used to have those little pails? O: Yeh, later on when his teeth got bad, he couldn&apos;t chew, then he used to chew that smokin tobacca. That smokin tobacca came in cans, you know. R: Yeh, didn&apos;t Grandma Kelly smoke a little bit? Once in awhile? R: I thought she had one of those clay, white clay things? O: No, my Grandma Kelly did. My Grandma did. O: My Grandma did, yeh. R: She smoked a pipe? O: Yes, she smoked a pipe. R: Well that was kind of common. Almost everybody did then, didn&apos;t they? O: That was common among the women ... the old Irish folks at that time. They smoked clay pipes. R: And then they&apos;d break and then they&apos;d have another one. O: And then they&apos;d break the stem off and eventually the pipe ... the stem wouldn&apos;t be over an inch long. R: So they&apos;d keep smokin&apos; it? O: It&apos;d break off then and they just keep the pipe and keep smokin&apos;. I heard my mother talkin about the clay pipes, some of the old ladies smokin it...the bowl was right up under their nose, an inch long. R: Well, didn&apos;t they use corn cob pipes in those day or not? R: Or was that something later? O: No, that was a little bit later. Clay pipes, I heard my Mother talk about but I heard my Dad talk about early in his life smokin corn cob pipes. You know you had to break those corn cob pipes in just right, because if you didn&apos;t, they&apos;d burn out. R: I think you had to go a little slow, didn&apos;t you? O: You had to kind of coat &apos;em up on the inside with sort of a carbon or something. R: And then when you cleaned them, you didn&apos;t dare clean all that carbon because it&apos;s just like breaking in a new pipe? O: Yeh, you&apos;d have to leave that there so it wouldn&apos;t burn a hole through the pipe. O: No sir, no sir. R: Well ... ah ... when did Grandpa Kelly start using machinery. Did my Grandpa Kelly have a tractor before we had that Whetmore? R: That was the first tractor in the family? O: That was the first tractor in the family. We used to farm when I first remember ... we farmed a half section and then we farmed a quarter section where Arley Haag, you know, lived down there where Andrew Ollers land is. R: Oh, way down there south? R: Oh you lived where Mike Goebel lived? O: Yes, and we farmed that quarter section in there because it belonged to Mike Hess. R: It was across from Carl? O: Joe Kohler. We farmed that for years and we always had two or three hired men and we had 16 or 18 head of horses, you know. All the men slept upstairs in that little room, you don&apos;t remember, no. R: Where Goebels used to live? O: Yes. The room would hold two full sized beds and then a cot. We all slept up there, all the hired men. Of course, Mother and Dad&apos;s bedroom was downstairs and off to that was the girls&apos; room but we had the big room. Sometimes there&apos;d be 4 or 5 men sleeping up there. R: I don&apos;t remember that room. The only thing I can remember is that Mike used to have the Aladdin lights and they were so white after we were used to the electric lights over at our place and the 32 volts. O: Of course, they changed those, see, after Mike moved there, you know, that was before ... when we got married ...before we got married, why we move down to that place, you see, and we were living down there and then Mike moved up there and then a year or so after that they weren&apos;t satisfied with the house, they didn&apos;t like the house, it was such an old house. Mrs. Harney remodeled the house, so you never did see the house that we lived in. That was all completely remodeled. I don&apos;t know whether that upstairs room was changed much. I never went up there. R: When did Mike put in the carbide for the lights? O: Oh, a year or two after he moved up there. R: They didn&apos;t use it very long, maybe it wasn&apos;t very good? O: No, I don&apos;t think so. I don&apos;t know. R: Because the first I remember is the white carbide light laying all over the yard. They put it in that hole and nothin&apos; ever happened and they were using the Aladdin lamps with the mantel. O: Mike didn&apos;t like the trouble of taking care of that. R: It looked like it was a lot of care. O: Yes, it was. It took a lot of attention, you know. R: What did it do, run through a pipe? They put it in a little well, didn&apos;t they? O: Well we were married ... he moved there the first of March of &apos;17. See we were married on June of &apos;17 and we moved down there in March of &apos;17 and Mike and Anne moved up there. R: Oh, well they got married before you did, didn&apos;t they? R: Were they still living in Remsen? Was he still doin grain in Remsen, then? O: When they were married he were still graining and this man Jensen Nelson was ... Daddy had rented the farm to ... after we quit farming, he rented it to Jensen Nelson and then when Mike and Anne got married, why, Mike wanted to farm the place and Anne didn&apos;t want to. Anne wanted to move to Remsen but Mike insisted on, he wanted to farm and so they decided ... they went and they lived in this old house. Of course, they were married, he moved in in March. I think they were married about 5 or 6 years before we were married but anyhow they weren&apos;t married &apos;til the fall and Mike moved in in the spring and he lived in the old house and Daddy started building this new house. R: Oh, on the farm that we lived now? R: And that&apos;s the house that I was born in? O: That&apos;s the house that you were born in, yes. R: Oh, that was 1917 then? No. O: ... buy that 80. Of course then after Mike had moved back, up to the half section, he farmed the whole half section then and we farmed the 200 acres. R: Gee, Mike farmed that a long time then, didn&apos;t he? O: But then this land boom came along and I had written to Mrs. Harney and asked her if she wanted to sell any of the land off and she said yes that she wanted to sell the west 80 because she could use some money and so I ... Daddy told me to ride the train back. I went back to Galena and I bought the 80 from her for two and a quarter. When I came back home, Mike had found out I had bought that west 80, he was terribly mad. R: Well, let&apos;s see, at two and a quarter, that would be nine thousand dollars, wasn&apos;t it? R: Twenty-one thousand.. You had it paid for though, didn&apos;t you? O: I had paid that off to sixty-five hundred dollars. I got it paid down. Of course, Mrs. Harney had discounted some. At one time I was going to turn it back to her because the depression was so bad, so she discounted some but I finally paid the thing off to sixty-five hundred dollars, and then I turned it over to the mortgage holder for sixty-five hundred dollars. O: Mrs. Shidler. Henry Shidler and his wife, yes. I tried to ... I went up to ... one Sunday morning I went to try to sell it to Marius Bogh. I asked $100 an acre for it. That would have given us $1,500, you see. Fifteen hundred dollars would have been an awful lot of money at that time. O: And I thought he was going to buy it and he almost, well he said he didn&apos;t want to buy it today. He said "I&apos;ll be down tomorrow." Of course that was right across the road from their quarter, see. He said, "I&apos;ll be down tomorrow and we&apos;ll talk it over." R: I always wondered why he never bought that. O: And then he didn&apos;t come down on Monday but he came down on Tuesday morning. R: "Grandpa can&apos;t talk and eat candy." O: He came down on Tuesday morning and I was so disappointed. He said, "No, I&apos;ve got", and he points to his lip, he said, "I&apos;ve got something on my lip here." He said, "I went down to Sioux City yesterday." That would have been on Monday. He was suppose to come down to our place on Monday, you see. He said, " I was down to Sioux City yesterday and I&apos;ve got a cancer on my lip." And he said, "I&apos;m just not going to buy the 80 cuz I don&apos;t know how bad this could get." R: He&apos;s still living, isn&apos;t he? R: Well this was in about what? &apos;34? &apos;33? O: Well it&apos;d be about &apos;34. R: Well, $8000 would have bought a quarter section as a down payment. O: Keenan, John Keenan, the attorney and asked him about it and he said many people are doing that now. Now Charlie Trinan did that in Remsen before that, the year before that, so he drew up a contract, Keenan did and he figured out what ... of course, I knew what my Dad owed, the total amount, and how many creditors there were and he figured out what percentage reduction would have to be and he ... so we ... I started out with this contract and this contract stated that I will reduce my amount of money that the Kelly estate owes me by say 25% or 30%, whatever it was, and they all signed it with the exception of one and that man was Wickter, Joe Wickter, the hardware dealer in Remsen, and I only owed him $35.00. R: "Janice, why don&apos;t you bring in those shamrock bulbs for Grandpa in the car?" O: Seventeen thousand, somethin&apos; like that, but anyhow, when I got everything all cleaned up then they come around to me with a statement for me to sign that I didn&apos;t have any debts, you see. And because I was one of the heirs, I couldn&apos;t have any debts. O: So that&apos;s ... then I had to go out and settle my own accounts to the ... and of course the mortgage holders, they wouldn&apos;t cut because they just didn&apos;t have any reason for wanting to cut but I had to get rid of this 80 because ... and so that&apos;s the reason I turned it back. I tried to get $1500. R: Well that would have paid you all off, wouldn&apos;t it? O: That would have paid me off pretty well. So then I turned that 80 back and then I got my own account by Fred Phillips, I owed him and, I think ... they didn&apos;t have to discount my accounts as much as my Dad&apos;s but it was ... then I was clear. That was the spring of 1936 and I didn&apos;t owe a doggone cent of money anyplace. We didn&apos;t owe any money and my Dad&apos;s estate was clear and that&apos;s the year we dried out and I had 165 acres of corn in and bought the seed corn, you know, and I had some cash. I had ... I got ... Phillips was smart enough to tell me I should apply fer five or six hundred dollars more money than I needed because so I&apos;d have somethin to work on, and I bought my seed corn, operating expense. We didn&apos;t harvest a bushel of corn that year. R: You didn&apos;t have any hybrid seed corn though, was it? R: Just plain ole ordinary corn? O: Just plain ole ordinary corn but we bought it so it was ... and then that was the thing that started the thing down. R: Well then it dried out pretty much in &apos;37 too, didn&apos;t it? O: It dried out in &apos;37. O: In &apos;38 we had a pretty fair crop and then the fall of &apos;38, I started working for the Des Moines Register. Do you remember? O: Do you remember? I started the Carlson power drive ... I sold the Carlson power drive in &apos;37. Went up to Minnesota, remember? R: I don&apos;t remember. You took the Willys, didn&apos;t you? O: Yes, that&apos;s the year I got the Willys. O: Pulled a trailer, yeh, with the power drives and sold quite a number of them up there. Made no money. Yeh. R: Well, let&apos;s see, it was the drought in, what, &apos;36? Wasn&apos;t it grasshoppers in &apos;34? O: &apos;34 was the grasshoppers. R: There wasn&apos;t two good years either in &apos;33 or &apos;34, &apos;35, &apos;36. O: They weren&apos;t two good years. No. No. There weren&apos;t two good years. Do you remember, do you remember when Kathleen died? R: I don&apos;t remember what year it was. I think I remember it, pretty much. O: I always remember you. You had been out trapping pocket gophers or fishing or something. You came home and the doctor was out there in the house. Kathleen got sick in the afternoon, you know. Your mother had put her down to sleep and she woke her up and I was going to run the tractor until dark, plowing or something, I forgot what it was. I drove into the yard to get some more gas and your Mother came out with Kathleen on her arm and she was crying and I thought Kathleen was dead. She was ... and so we called the Doctor Lamb and he came out, and came right out and Doctor Lamb was in the house and you came in, and I don&apos;t know whether you had a pocket gopher or a string of fish, and you said , "What&apos;s the matter?" and I said, "Oh, Kathleen&apos;s awfully sick." and my goodness, you just threw up your hands and just started to cry, almost went into convulsions. Mother often talks about that, she said my goodness, when Bob carried on. R: I don&apos;t , I don&apos;t remember. I think I do remember she was on that couch. R: John Joseph was ... what he had just came home, didn&apos;t he? O: No, he never came home. R: He never came home? O: No. We had been to ... you see she was in the hospital about 12 days when John Joseph was born. She came home Thursday. Went down to grandma Strengs on Thursday and then she was suppose to come back out to the farm on Saturday ... Sunday. And do you remember Ricker was there then? O: Frances Ricker. You and Edward and Francis and I went to town on Saturday night and we came home and you youngsters went to bed and we went to bed, Francis went, and then I think that Otto Ottoson was there then, who was it, he had driven to town and came home and the phone rang about 11:00. I happened to hear it, I was upstairs, you know, I went down and your Grandma Streng was calling and said that I would have to come right in because John Joseph ... somethin happened to John Joseph and I went up and called Francis and told Francis that I would have to go into LeMars because ... and to tell you youngsters in the morning. I drove on in and when I came in, why we took him right to the hospital. He was bleeding at the naval and they&apos;d take blood from me and give it to him. I don&apos;t know how many times we did that, you know, about 5 o&apos;clock on Sunday evening, Sunday afternoon, why Dr. Downing came in and they gave him the blood then through the temple. They always gave it through the arm and leg. This time they inserted the needle in the head someplace up in the temple because he thought there was a vein up there that ... He would stop bleeding for an hour or two after that, after he had that what do you call that, transfusion to the brain or to the head, why he just started to pass away and he never did come out of it. But it was strange thing, he&apos;d be so white, almost gone, and when he&apos;d get this transfusion, he just perked right up.